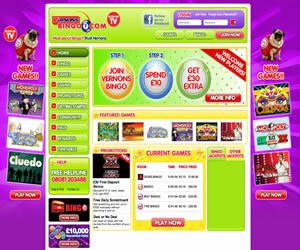 Littlewoods Bingo became Vernons Bingo in June 2012 and in the following months underwent a number of changes including a move from the G2 Gtech platform to the Virtue Fusion/Playtech software. The look of the site however remained the same with the exception of a new logo and some redesigned buttons. The purple and green colour scheme is certainly not the most attractive on the market but at least it makes a change from the usual pinks and lilacs we see all too often. Registering at Vernons Bingo is a simple procedure but if you have accounts at any of the other sites on the Virtue Fusion Network you may need to come up with a new username before you get to actually enter the lobby. Once you are in there though you are guaranteed hours of fun with plenty of 75 and 90 ball bingo rooms to choose from. The design of the lobby itself is basic but functional and by clicking on each tab you can find out important information such as the time to the next game, the value of the jackpot, the ticket price and the number of players you will be competing against. The rooms themselves sometimes take a while to loads but once you are in there you will be greeted with a pop up box explaining how the game works. You can read through this or dismiss it and there is a tick box so you won't see it every time you log in. Because Vernons Bingo is a networked site you will usually find there are a lot of players in the room and everything is very fast paced which sometimes means you might be overlooked by the chat hosts. There is however a messaging facility built in so you can contact them directly if you need to. The rooms are nicely laid out with plenty of space for your cards and you can even zoom in or out if you need to. The Virtue Fusion software does not have many options built in but you can change the colour of your font and there are a number of smilies and commonly used acronyms which saves all of that repetitive typing. One nice feature though is the ability to add your bingo buddies to a friends list so you can message them privately. 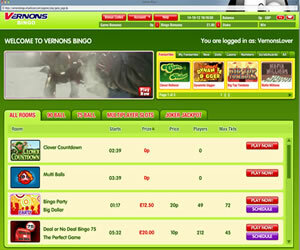 You can use your Vernons Bingo log in details for Vernons Casino too which gives you access to dozens of fantastic games including Table Games, Card Games, Jackpot Games, Slots, Video Poker and Arcade Games. The first time you access the casino you will even earn yourself a superb welcome bonus and if you fancy playing you favourite games on the move there is a mobile version available. 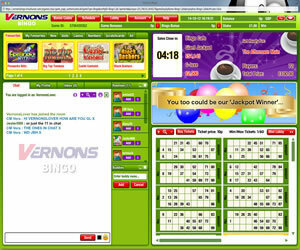 Vernons Bingo is not a bad online bingo site; it offers plenty of games, lots of promotions and a well established software platform. Sadly they offer nothing more then any of the other brands on the same network so if you already call a Virtue Fusion powered site home, you may as well stay where you are and work on building up your loyalty points and unlocking the many benefits available through their VIP Club. Vernons Bingo offers 75 ball pattern bingo, 75 ball bingo and 90 ball bingo as well as a large number of slots and casino games. The site is also home to Community Slots and the popular Joker Jackpot game. Vernons Bingo's wagering requirements are met.